For today’s retailers operating profitably remains a challenge amidst tremendous competition, rising operating costs, increased customer expectations and most importantly reduced customer visits. As a result today’s retailers have now started using a very fundamental metric to judge their performance; visitor traffic. The potential of a store depends on the number of customers who visit the store, since only people who visit the store are likely to make a purchase. As a result today, for retail chains to be able to calculate the potential of a store recording total population and pedestrian traffic figures has become extremely important. More importantly in addition to using these traffic numbers for revenue estimates managers can use this information for advertising performance analysis, safety requirements or reviewing staffing policies. Several important metrics including sales numbers, store hours, staff hours, SKU’s are used today to estimate store potential. However, these metrics are no longer sufficient. Today footfall data is widely considered to be one of the most important and reliable metric available to the retail industry. By combining footfall data with other existing metrics retailers will have access to critical information that will aid them in standing out. Determine Shopper/Buyer Conversion Rates: Selling to someone who is already in your store is far easier and much more cost effective than attracting a shopper to enter your store for the first time. One of the big issues that retail organizations face is not having this objective traffic data necessary to calculate your shopper/buyer conversion ratio. Measure Advertising Effectiveness: With all the money spent on advertising and marketing, retail organizations want to be able to identify which advertising and promotional initiatives have the most advantageous ROI. The effectiveness of any initiative can be measured more accurately using traffic data instead of just sales/transaction data. Traffic data, in combination with sales data, is a powerful tool to determine the actual reason an advertising or promotional activity was or was not successful. Making Resource Availability More Effective: Making sure there is an adequate resource level to handle the customer traffic flow is much more accurate with a traffic intelligence system. Increasing Sales: Experienced retailers can often predict a store's performance based on its size and location. Without traffic data, it is difficult to determine whether the problem is a lack of traffic, too few or ill trained sales associates, or other systemic issues. 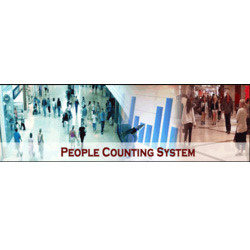 Our Solution: ez consultants today are ready to deliver a state of the art people counting solution. The solution primarily consists of two components i.e. the hardware and the software. We have a range of counters that customers can choose from that that accurately detects the movement of people across marked zones. Once configured the system will be a completely non-intrusive system that is capable of bidirectional counting of traffic. Counting data logged by these sensors is then moved to secure databases for further analysis. The reporting system is a web based system delivered over the internet in a SaaS model that delivers several analytical reports for critical decision making. Using the reporting system, one can view several reports related to customer traffic in your stores from anywhere in the world. A drill down report offers easy access to detailed hierarchical data. ez consultants is a sole proprietorship organisation & it was incorporated in 2001 at Navketan Society, Kothrud, Pune, Maharashtra, India. Our firm is a customer centric and technology enabler firm and distinguishes itself as a service provider for Application Software Solutions that helps clients in realizing high and fast ROI in terms of application of Information Technology (IT) to their current processes. We have designed, developed & implemented hundreds of solutions across India for Real Time Data Acquisition (RT-DAQ), Statistical Process Control (SPC), Component Marking (Traceability) Solutions, PC Based SCADA Software, People Counting Devices and Analytics, SCADA, Machine Breakdown Entry and Analysis Software, Gauge Calibration Software, Transport Billing Software, Independent Software Vendor (ISV) and more. We understand technology and apply it to make our customers products better and deliver overall value. Our passion for quality flows through each member of our organization and it plays an important role in the way we do business. We focus on overall business value to the clients, customer partnership, technology, domain knowledge, process focus and optimization.